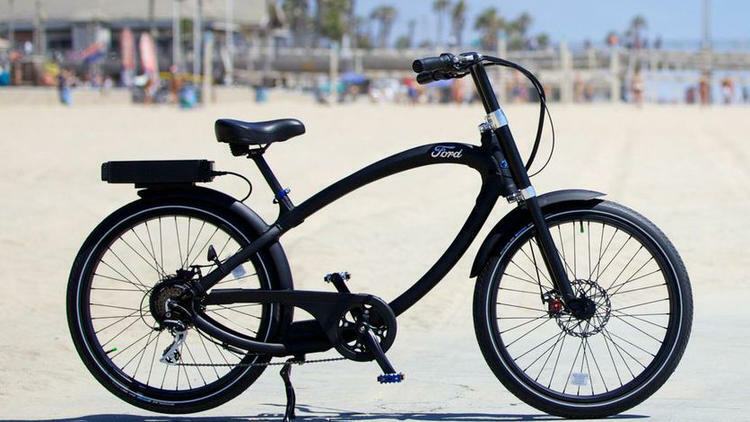 Go Further on the Bike Path with Ford Bicycles! Ford has been quite outspoken about their intention to become a mobility company, not just a car company. What does that mean, exactly? Well, Ford rolls out more and more answers to that question every month, from an in-car app to reserve parking spacing in crowded city centers to the world’s first wheelchair accessible SUV. But one new avenue Ford is embarking down got us really excited this week: Ford brand folding bicycles! While none of us were looking, Ford has been going hard at making bikes that appeal to people who don’t like to go places without their Ford car or truck. There’s the Ford electric bike from Pedego, which lets you transition seamlessly from your plug-in C-Max, Focus, or Fusion to a plug-in cruiser bike. As with all of the bikes we’ve seen that Ford partnered to create, what we love so much about the Pedego isn’t the Ford name on the side, it’s the work that went into designing a bike that looks like a Ford bike, even though Ford makes things with 4 wheels, not 2. But the bike that really has our gears turning – because while we love batteries in our cars, we like our bikes to make us sweat a little – is Ford’s partnership with Dahon, the world leader in folding bicycles. The synergy between the two products is so flawless it’s almost beautiful. Say you and your significant other love your Ford C-Max Energi. You’d also love to get outside more, but it’s impossible to fit a bike in your car, and you aren’t sure you’re ready for a bike rack. Enter the Dahon Ford C-Max. It has the same logo as your car, it somehow even has the same style as your car if it were a bike, and it folds to fit in your trunk! You and yours could all go for a ride without sweating the details of loading up the car, and without sitting on or in anything that wasn’t a C-Max! We weren’t in the market for a bike last week. We actually are now. That sounds like a successful mobility solution to us! Now if you’ll excuse us, we have to decide between a $300 Taurus and a $325 C-Max! « The ALL-NEW 2017 Super Duty. Breathless.